On 29 March 2013, Metropolitan Hilarion of Volokolamsk, chairman of the Moscow Patriarchate’s Department for External Church Relations, rector of the Ss Cyril and Methodius School for Post-Graduate and Doctoral Studies, met with the delegation of the Catholic University of Leuven (Belgium). The delegation included Prof. Dr. Lieven Boeve, dean of the Faculty of Theology and Religious Studies; Prof. Dr. Johan De Tavernier, vice-dean for international affairs; Prof. Peter De Mei; and deacon Victor Yudin, assistant professor at the St John the Theologian Institute (Leuven). 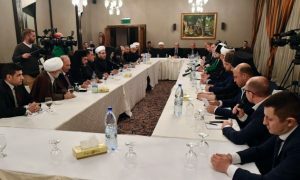 Taking part in the meeting were also Archpriest Vladimir Shmaliy, vice-rector of the Ss Cyril and Methodius School for Post-Graduate and Doctoral Studies, and Hierodeacon Ioann (Kopeikin), assistant to the DECR chairman. Discussed at the meeting was scholarly and educational cooperation between the Ss Cyril and Methodius School for Post-Graduate and Doctoral Studies and the Faculty of Theology and Religious Studies of the University of Leuven, as well as opportunities for students of the Moscow Patriarchate to study at the University of Leuven. 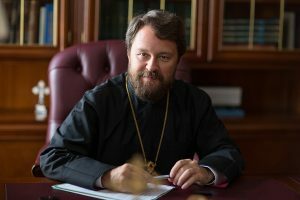 Addressing the Dean of the Faculty of Theology and Religious Studies, Metropolitan Hilarion noted that one of the Russian Orthodox Church’s priority tasks was to reduce and even overcome the distance between the Russian and the European theological education. 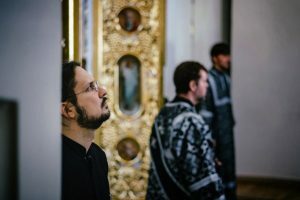 According to Metropolitan Hilarion, programs developed together with the leading European Universities can provide students of the Moscow Patriarchate with high quality theological education that will guarantee that theology will eventually take its rightful place in the Russian education system. The participants in the meeting signed an agreement on cooperation between the Ss Cyril and Methodius School for Post-Graduate and Doctoral Studies and the Faculty of Theology and Religious Studies of the Catholic University of Leuven.